To be considered for publication in The Agonist (essays, reviews, interviews, etc.) initially send ONLY a proposal, which should include a short list of prior publications, academic affiliations if any (we do accept proposals from independent scholars, philosophers, etc. ), and brief bio about yourself. Unsolicited manuscripts will not be read. The proposal should be sent as an email to: nceditors@ietzschecircle.com. Response time to proposals is anywhere from two weeks to three months; depends on our editors availability. Once approved by the editorial board, a deadline will be determined for the submission, and all further documents should be in MS Word (editing) and Adobe PDF (for dowloading) format. After submission, it is important to do follow up after a few days later. Submissions accepted for publication should be set at point twelve (12) Times New Roman or some other standard font, rag right, and double-spaced. Between paragraphs, there should be extra leading (more vertical space between paragraphs than between the individual lines within a paragraph). Lengthy quotes not in the body of a paragraph should be single spaced, as should footnotes, and should be set at point ten (10) in the same font used in the main text. Italics are to be used for author’s emphases, book and journal titles, and foreign terms. For all dashes except in hyphenated words, EM dashes are to be used with no spaces around the dashes, e.g., “Nietzsche attempts to take, seduce us beyond the epochal truth regime of good and evil toward a topos of radical freedom, innocence—not a simple matter, outside/inside, beyond, beneath “theoretical optimism,” nihilism—resisting, playing amid systematic determination, beyond, before Zoroaster” (Luchte, “The Wreckage of Stars: Nietzsche and the Ecstasy of Poetry”). Please number pages in the upper right-hand corner, omitting the numeral on the first page. An electronic version (Microsoft Word) of the submission should be submitted to the editors. Currently, we are considering essays only in English. Important! Please note that, when submitted work approved by our editorial board, we convert them in html format for web publishing, and sometimes this procedure takes a lot of time for our web developers for lenghty many page essays (or reviews, interviews, etc.). For Lenghty essays, reviews, interviews, etc., it is important to provide a short summary (1-2 pages), so that your work can be published faster without any delays. This is not requirement, but surely helps us publishing your work much faster on our site. 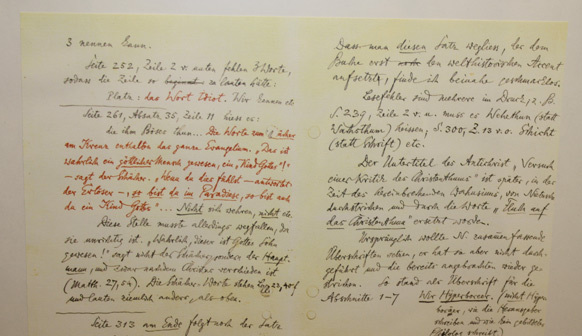 Quotations from Nietzsche’s works should be followed in the main text by parenthetical references to the work in abbreviation followed by section or note numbers, e.g., (BT §7), (GS §124), (GM III §7), (TI “Ancients” §3). (For a complete list of standard abbreviations, see below.) The translation being cited should be indicated in a footnote to the first quotation from the work. If the author is rendering Nietzsche’s German into English, each quotation should be footnoted with a reference to a standard critical German edition of Nietzsche’s works, preferably the KSA. All other scholarly references should be given in the footnotes. A separate page should contain a brief biographical note for publication, including the author’s name and address, email, phone number(s), institutional affiliation (if applicable), and titles and years of publication of recent essays or books. Books for review and all inquiries concerning books listed as received for review should be directed to the editors. As noted above, references to Nietzsche’s writings are to be included in the body of the essay using the standard English title abbreviations indicated below. With reference to translations, Roman numerals denote a standard subdivision within a single work in which the sections are not numbered consecutively (e.g., On the Genealogy of Morals), Arabic numerals denote the section number rather than the page number, and “P” denotes Nietzsche’s Prefaces. Unless the author is translating, the published translation used should be indicated with a footnote to the initial citation reference. Kritische Gesamtausgabe (KGW) (Berlin: de Gruyter, 1967—) is cited by division number (Roman), followed by volume number (Arabic), followed by the fragment number. Kritische Studienausgabe (KSA) (Berlin: de Gruyter, 1980) is cited by volume number (Arabic) followed by the fragment number. Briefwechsel: Kritische Gesamtausgabe (KGB) (Berlin: de Gruyter, 1975—) is cited by division number (Roman), followed by volume number (Arabic), followed by page number. Sämtliche Briefe: Kritische Studienausgabe (KSB) (Berlin: de Gruyter, 1986) is cited by volume number (Arabic) followed by page number. References to Thus Spoke Zarathustra list the part number and chapter title, e.g., (Z: 4 “On Science”). References to Twilight of the Idols and Ecce Homo list abbreviated chapter title and section number, e.g., (TI “Ancients” §3) or (EH “Books” BGE §2). References to works in which sections are too long to be cited helpfully by section number should cite section number then page number, e.g., (SE §3, p. 142), with the translation/edition footnoted. ...Focus on the impact of Nietzsche's knowledge of music on his philosophy and the development of his thought. ...the first order Empfindung associated to music is the dissolution of individuality which from a posthumanist perspective brings about the realisation of the embeddedness of human beings in this world. Hence, music can bring about more than pain and pleasure in the recipients.